Last week, we told you about The Oatmeal creator Matthew Inman's mission to purchase the land, laboratory and foundation beneath what was once Nikola Tesla's Wardenclyffe Tower, and to erect a museum in Tesla's honor. At the time, Inman was gunning to raise $850,000 (to be matched dollar-for-dollar by a grant from New York State) over 45 days, that would go toward securing the $1.6-million property. In a matter of days, The Oatmeal's fundraising campaign has met, and now vastly exceeded, its goals. In 9 days, we managed to raise over 1 million dollars to go towards buying back Tesla's old laboratory, and with the $850,000 matching grant from NY state this puts us at 1.85 million bucks. At its peak, the campaign was raising $27,000 per hour, crashing Indiegogo [the crowdfunding platform used to raise the money], and probably setting some kind of land speed record in awesomeness. The infographic featured here runs you through some more of the absolutely ridiculous statistics collected by indiegogo over the course of the first $873-thousand dollars of fundraising. Sometimes, the internet decides to just step up and make big projects happen. This was definitely one of those times. Even though we've already hit our goal, I plan on letting the campaign run the full 45 days. Every extra penny we earn will go toward restoring the property, building exhibits, and turning this land into something worthy of Tesla's awesomeness. The original goal of $850k was enough money to bid on the property, but it's going to take a lot more to turn it into an actual museum. 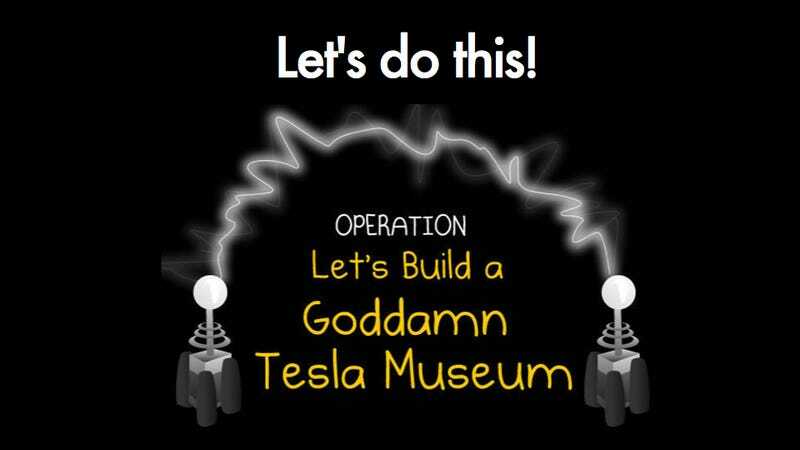 Find out what's next for the Tesla Museum Campaign over at The Oatmeal.